Dendritic cells (DCs) as antigen presenting cells of the mammalian immune system characteristically have the ability to activate T cells which can be exploited for cancer immunotherapy. Although immune responses are clearly induced by the present DC vaccines, clinical responses lack behind since cytokine-treated DC, which are normally used, are limited in their IL-12 production - a cytokine critical for immunologic memory. The present technology overcomes these limitations. 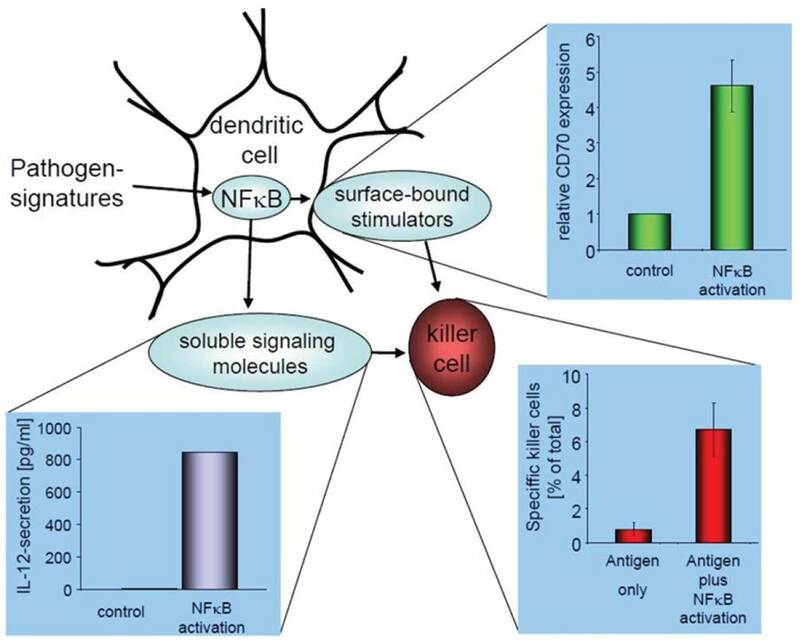 Here DCs are activated by triggering their NFκB-pathway via mRNA transfection. This results in constitutively active and stabilized DCs that secrete enhanced amounts of immune-stimulatory cytokines including IL-12p70. Furthermore, these DCs comprise an intrinsic activation signal and therefore stay active longer. This is not only crucial since DCs need time to reach lymphatic tissue to do their job. Most importantly, cytotoxic T cells induced by these designer DCs combine a memory-like phenotype and a markedly increased secondary expandability with a high lytic capacity. This offers cancer patients a DC-vaccination treatment that has very little adverse effects and can be combined with other, new immunotherapeutic approaches. Preclinical testing is at a stage that allows starting a phase I clinical trial.